Ensure that the power is on (the center LED should be green). Adjust the sound volume on X1-N6. Scroll the volume wheel if necessary. Adjust the sound volume on the computer. Make sure X1-N6 is selected as the audio output device on your computer. In Windows, go to Start > Settings > Control Panel > Sound and Audio Devices. 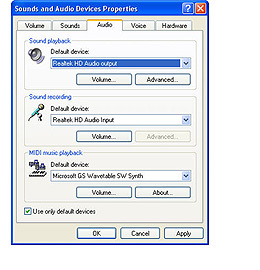 In the “Audio Source” tab, please change the Speaker and Microphone settings to your computer’s original sound card as the output and input device.